The Ejisu police in the Ashanti Region have nabbed two people for kidnapping a 14-year-old boy and demanding a ransom of $3,000 from the family. 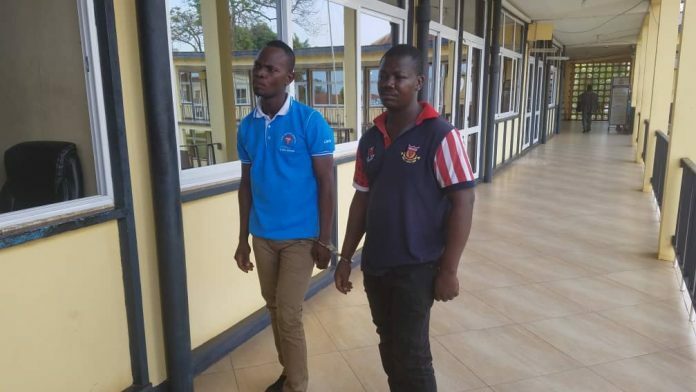 The Kidnappers identified as Charles Appiah (38) and Manasseh Fumey, a 29-year-old private security officer kidnapped the victim at the KNUST junction in Kumasi. The third suspect identified as Felix posed as a resident abroad masterminded the plan and is currently on the run. He befriended the victim who is second year Junior High Student and promised to buy him a laptop and a smartphone. Felix later asked the victim to meet him at KNUST junction to receive the items he promised him. The teenager was chloroformed upon arrival and was taken to an uncompleted two-storey building at Apatrapa. After he was kidnapped, they demanded an amount of $3,000 from the victim’s grandmother whom they lived in the same neighbourhood. The Public Relations Officer for the Ashanti Regional Police Command, ASP Godwin Ahianyo stated that the victim shouted for help from where he was held, hostage. This drew the attention of passers-by and informed the police which they acted swiftly and rescued the victim.